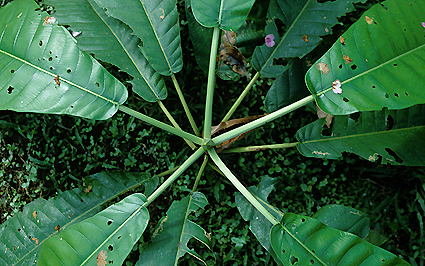 Shrubs or small, medium-sized to tall canopy trees; raphides absent; axillary thorns absent. Stipules apical caps, splitting irregularly on one side, conic, circumscissile. Leaves opposite or whorled, 3 to 6 per node, long- to short-petiolate, subsessil or sessil; blades ovate, elliptic, narrowly obovate, obovate, oblong, oblanceolate or lanceolate, chartaceous, papyraceous or thinly to thickly coriaceous; foliar pellucid glands absent; domatia sparse tufts of hairs or absent. Inflorescence terminal, not frondose, staminate inflorescence corymbose, pistillate inflorescence uniflorous. Flowers functionally unisexual (staminate and pistillate flowers on separate individuals). 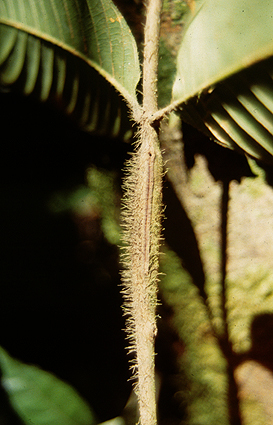 Calyx cup-shaped or short- to long-tubular, with small lobes, persistent; lobes 5 to 8, deltoid, narrowly to broadly triangular, linear, small or long. Calycophylls absent. Corolla hypocrateriform or narrowly infundibuliform, actinomorphic, white to cream-white; tube externally pubescent, tomentose, hirsute or strigose, internally glabrous or pubescent, without a pubescent ring inside; orifice annular thickening absent; lobes 5 to 8, right-contorted, ovate, elliptic or oblong, margin entire, rounded at apex. Stamens alternate to the corolla lobes, included or partially exserted (only tips exserted); anthers narrowly elliptic, oblong, narrowly oblong or elongate, round at base, round at apex, dehiscing by longitudinal slits, dorsifixed near the middle or near the base; filaments attached near the mouth of the corolla tube, free at base, slender, short (anthers subsessil), equal, glabrous. Pollen porate, apertures 3, exine surface reticulate, released as monads. Style exserted just beyond the corolla, terete throughout, not fleshy, glabrous; lobes 2, ovate or oblong. Ovary inferior, 2- to 5-locular, ovoid; placentation parietal, placenta peltate to the entire lenght of the septum, ovules many per locule. Fruit a berry (Genipa-type), thickly woody or fleshy. 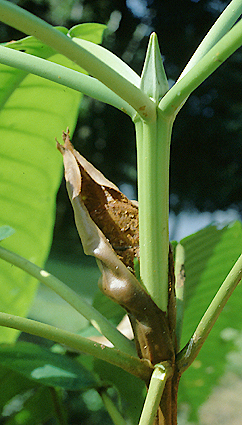 Seeds horizontal, large, dorsoventrally compressed, ellipsoid-ovoid; wings absent. Geographic distribution: Northern Central America (up to southern Mexico), southern Central America, northern Chocó area, Magdalena-Llanos area, Napo-Marañón drainage, southwestern Amazon Basin, western Amazon Basin, Guayana Shield, central Amazon basin, eastern Amazon basin, Brazilian Atlantic coast and Brazilian planalto.